Medal winners, from the left, Krisz Horvath, Alfie Baker and Artur Tomasevic. 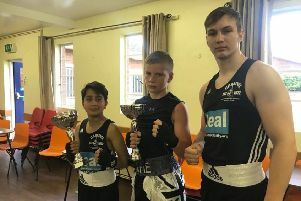 Six Peterborough Police Amateur Boxing Club fighters traded blows with the best when taking part in the big Monkstown Box Cup event in Dublin at the weekend. And three of them returned from the biggest box cup tournament in the world with medals - two of them of a shining gold variety. It’s an open class three-day tournament for teams from all over the world including USA, Israel, Germany and Sweden with over 2,000 spectators in attendance every day. Alfie Baker (11) from Stanground and Artur Tomasevic (19) from Welland were the golden boys. Tomasevic won his gold medal on a walkover when his scheduled opponent in the 91kg final pulled out but Baker had to do it the hard way. 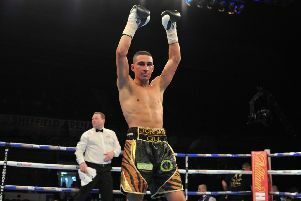 He boxed M. Khalafzah from the Howden club in the 56kg final and the Yorkshire lad was the aggressor for all three rounds, forcing the pace with strong hooks aimed at the head and body. But Baker had the ability to avoid the punches with his nifty footwork and picked off his opponent with long range shots as he ploughed in. He forced Khalafzah to take a standing count of eight in the second and went on to win handsomely on points. The silver medal was won by Krisz Horvath (16) from Millfield who was unlucky to pick up an injury in the 91kg final against William Howe from the Phil Thomas School of Boxing. Horvath started well and hammered home some great left hooks. But towards the end of the first round he twisted his knee and the referee called it off at the start of the second with Horvath struggling to move round the ring. Shae Gowler (12) from Fletton appeared to have done enough for victory against Martin McDonnagh from the St Mary’s club in Ireland in the 36kg semi-finals. He dominated all three rounds, forcing McDonnagh to take a standing eight count in the second round, but lost on a split decision. Imraan Shirazi (12) from Bretton was another to lose on a split decision. He fought D. Staleaf from Salisbury ABC in the 36kg quarter-finals and both lads showed an abundance of skill and boxing ability. Again the Peterborouugh camp thought their boxer had done enough but it wasn’t to be. Finally the sixth Peterborough lad in action was Aamir Shirazi (11) from Bretton, who handled himself well against M. Doherty from the Drimnagh Club in Ireland in an exciting 30kg skills bout. This was a quality skills bout for both fighters, showing that they really are stars of the future. In a special supporting bout at 88kg, Tomasevic agreed to take on a more experienced Irishman and lost on points to Danny O’Brien (23). The club are still after company sponsorship. Anybody interested can contact Baker on 07921095122.